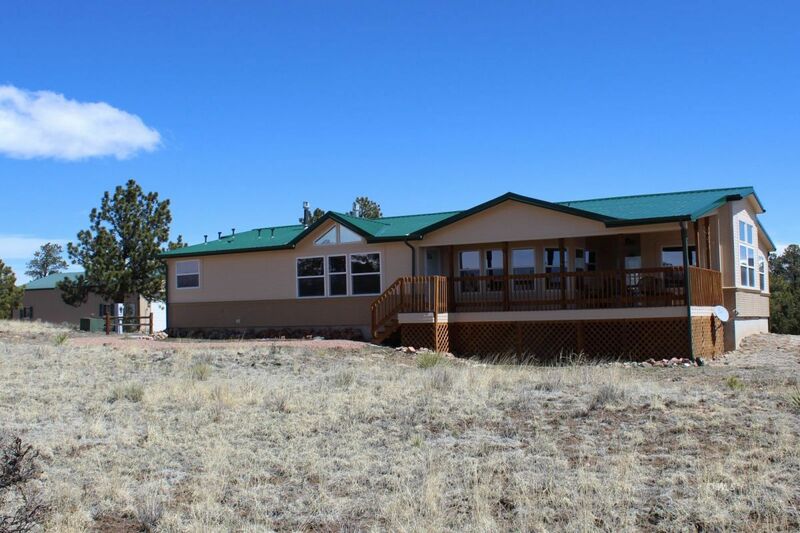 Mountain Home (3 Bedroom & 2 Bathrooms) on 5+ Acres with Huge Shop and Year Round Access! Nestled in the Wet Mountains with panoramic views of the the Sangre de Cristo's, Wet Mountains and the Wet Mountain Valley! Inviting Covered Deck leads you to the Main entry. This is where you can take in the spectacular views of 5 of the "fourteener's" (14,000' + peaks) of the Sangre de Cristo Mountain Range. Welcome your guest to your nice sized entry/sitting room which opens into Living Room/Formal Dining. The Fireplace/Propane stove is a lovely accent to the living space. The kitchen is the Center point to home. It features newer appliances, eat in bar, lots of storage, pantry and breakfast nook! Family room/Office is open with a 3 sided fireplace giving this mountain home a taste of contemporary style. The open floor plan is terrific for entertaining. Master Suite futures private propane fireplace/stove, large master bathroom with walk in shower, Garden tub, and double vanity. Huge Master closet that any homeowner would love to have! Two guest rooms that easily fits Queen sized bedroom sets and roomy closet space. Off of the back porch - large separate laundry room.